We’d like you to meet Anton Benkestok, an educated teacher and master’s student of ICT Educational Design at Aarhus University, Denmark. He also leads an effort to create a dizmo inspired interactive table. A great project on the side of his studies, Anton has achieved an impressive track record on marketing the digital surface already. The interactive table is a digital surface that will allow students to interact via a smart interface and experience new and exciting activities on a table/station type format. Compared to a normal table, the device will act as a medium for channelling various activities for educational purposes in schools and colleges. The main target for Anton was to have a prototype ready for the 2014 IDC conference, taking place on June 18th. Anton couldn’t source the infrared camera that we recommended using to build the table. We immediately sent him ours, and he made it on time for the conference! Since the conference, Anton with his team have met to discuss how they can improve the prototype and have started contacting schools regarding field testing of the new prototypes. “…there is a disconnect between society and the classroom; when the students are at home, visiting friends, walking down the street, they are surrounded by a new digital society. This is not the case in the classroom, and as a consequence the school can’t fulfill its purpose. It is not about forcing the integration of digital technologies into the classroom. It is about reestablishing the connection between the new digital society in which we live and the classroom. The digital table represents a powerful and healthy bridge between the traditional educational world and the digital world…”. Well put and well done Anton! 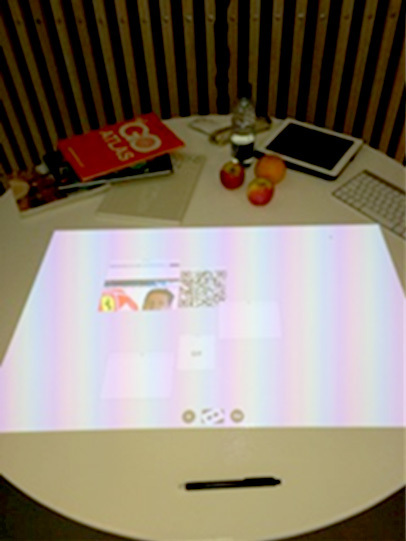 The interactive table was presented at FabLearn 2014 Europe, which is a part of IDC 2014.